HOW DO I SETTLE MY BUYING TRANSACTIONS? 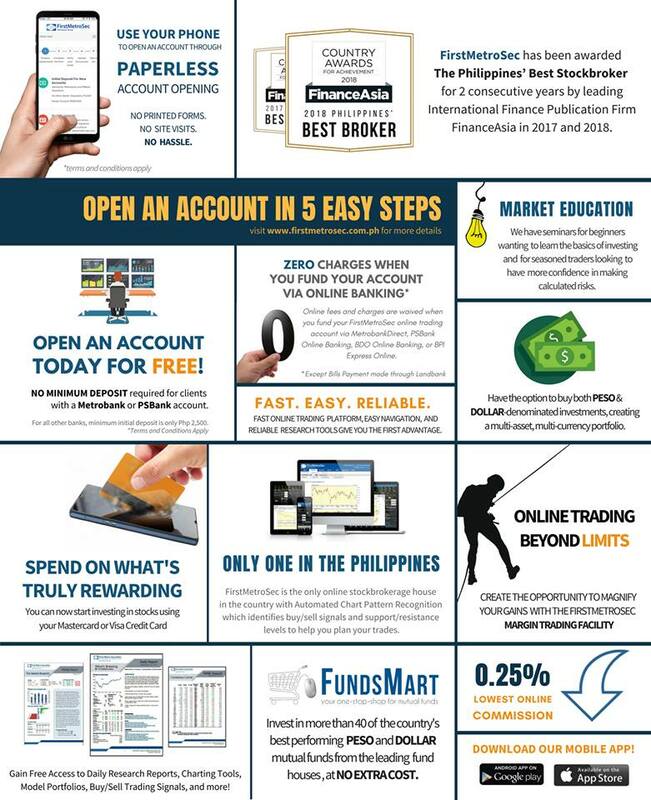 You can purchase up to the amount of your pledged funds in your MetrobankDirect Account plus your available funds in First Metro Securities. For purchases exceeding your fund with FirstMetroSec, your MetrobankDirect Account will be debited three trading days after the purchase. You can purchase up to the amount of funds in First Metro Securities. 1. 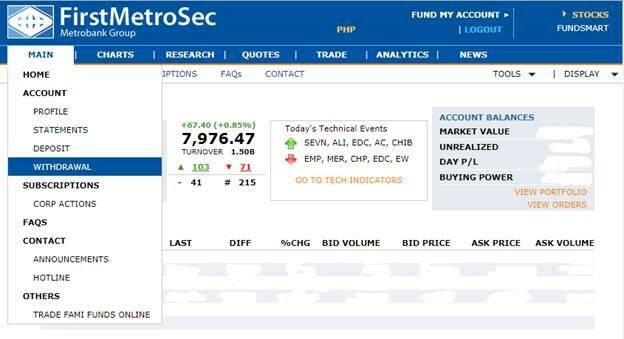 Go to the First Metro Securities website (www.firstmetrosec.com.ph) and log in using your username and password. 2. Click on MAIN > WITHDRAWAL. 3. Select either ALL CLEARED CASH BALANCE orENTER DESIRED AMOUNT. Click NEXT to proceed. 5. A confirmation message that the withdrawal request has been sent for approval, together with a transaction reference number will appear. Withdrawal requests received BEFORE 1:30PM will be processed within the day. Requests received 1:30PM onwards will be processed the following business day. For withdrawal requests received before 11am (on a trading day), the funds will be credited to your settlement account on or before 3pm. For withdrawal requests received before 4pm (on a trading day), the funds will be credited to your settlement account on or before 9pm. 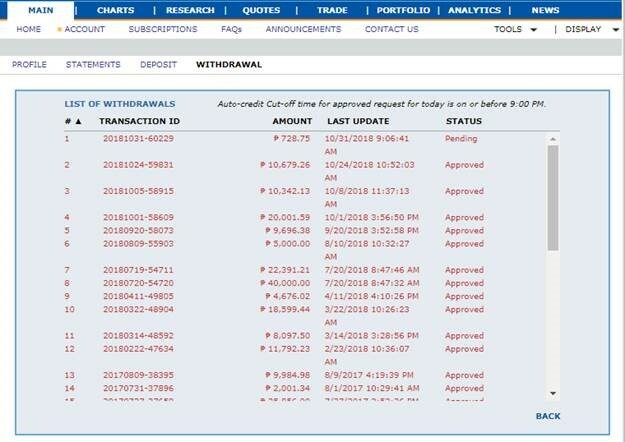 For withdrawal requests received beyond 4pm (on a trading day), the funds will be credited to your settlement account on or before 3pm of the next trading day. For non-Metrobank settlement account holders: Funds will be credited (via check deposit) within 2 days. All withdrawals are subject for approval. You can start trading once you have received an email confirmation that your account has been activated. The activation process takes two (2) to three (3) days upon submission of completed forms and identification requirements. WHAT IS THE PSE TRANSACTION FEE? All stock trades go through the exchange or the PSE, and for that, the PSE charges 0.005% of the gross trade amount of every transaction. 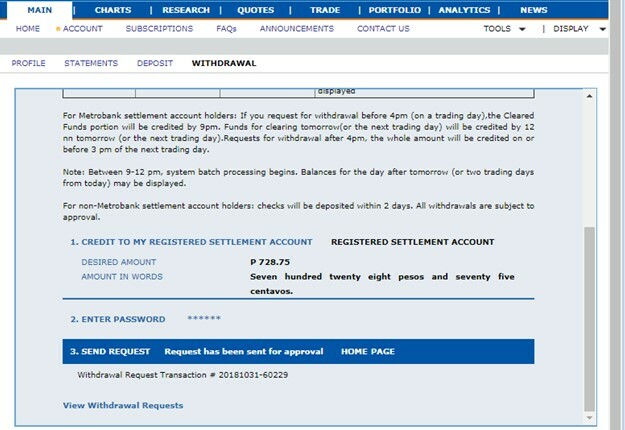 HOW DO I COMPUTE FOR THE PSE TRANSACTION FEE? For more details about the Stock Trading Costs from PSE, click the link below. HOW MUCH AM I CHARGED FOR EVERY TRANSACTION? 2 Broker Assisted Orders 0.75% of the gross value per trade or Php150 per day of activity whichever is higher. 0.50% of the gross value per trade or $3.00 per day of activity whichever is higher. D. SCCP Charges 0.01% of the gross trade value. 0.01% of the gross trade value. If transfer office is a bank, Php 150.00 per certificate. If transfer office is a non-bank, Php 162.00 per certificate. If transfer office is a bank, Php 100.00 per issue plus Php 20.00 per certificate. If transfer office is a non-bank, Php 112.00 per issue plus Php 22.40 per certificate. DO YOU IMPOSE A MINIMUM VOLUME PER TRADE? Stock trading on the Philippine Stock Exchange is done by board lot or round lot system. The minimum number of shares you can buy or sell depends on the market price of the stock at the time you place your order. The board lots and fluctuations for the different price ranges are shown below. CAN I TRADE ANY STOCK LISTED IN THE PHILIPPINE STOCK EXCHANGE? Yes, you can trade any stock listed in the PSE, provided that the stock is not suspended for trading. CAN I ENTER AN ORDER ANYTIME DURING THE DAY? Yes, you may enter your orders anytime during the day. Orders sent during trading hours will be sent to the PSE as soon as we receive your order. However, off-hours orders will only be re-checked by the system and, if valid, sent to the PSE during the Market Pre-Open/Posting period the following trading day. The PSE is open for trading between 9:00AM to 11:59AM and 1:30PM to 3:30PM on weekdays (except holidays). The Pre-Open period is between 9:00AM - 9:15AM. Online Clients are allowed to enter, modify and cancel Orders during this period. The Pre-Open No Cancel period is between 9:15AM - 9:30AM. Online Clients are allowed to enter Orders but cannot cancel or modify Orders during this period. AM Trading hours (Market Open) are between 9:30AM - 12:00PM. Orders are automatically matched at the Best Price in accordance with the Revised PSE Trading Rules, SEC Approved Amendments to PSE Revised Trading Rules and Implementing Guidelines. Odd Lot orders can only be posted or modified during this period. Market Recess period is between 12:00NN - 1:30PM. Clients are not allowed to enter/modify/cancel Orders during this period. PM Trading hours (Market Open) are between 1:30PM - 3:15PM. During this period, Orders are automatically matched at the Best Price in accordance with the Revised PSE Trading Rules, SEC Approved Amendments to PSE Revised Trading Rules and Implementing Guidelines. This period operates in the same way as the period of Continuous Trading. Odd Lot orders can only be posted or modified during this period. Pre-Close Auction period is between 3:15PM - 3:18PM. This period is the same as the Pre-Open Auction Period. During this period, Clients can enter, modify or cancel Orders in accordance with the Revised PSE Pre-Close Schedule. Pre-Close No Cancel period is between 3:18PM - 3:20PM. During this period, Clients are allowed to enter Orders but cannot cancel or modify Orders in accordance with the Revised PSE Pre-Close Schedule. The Runoff/Trading-at-Last period is between 3:20PM -3:30PM. Clients can enter Limit Orders at the Closing Price only. Market is closed at 3:30PM. CAN I PLACE A BROKER ASSISTED ORDER EVEN IF I AM AN ONLINE TRADING CLIENT? Yes, however, you will be charged a broker assisted commission rate which is 0.75% of the gross value per trade or Php 150.00 per day of activity, whichever is higher. You can send your orders through telephone (+632 859-0600) or by fax (+632 859-0699) or e-mail (sales@firstmetrosec.com.ph) or through the Short Messaging Service (SMS) or text (+63 917 826-2010). We will acknowledge as we post your order. Yes, orders can be cancelled as long as they have not yet been matched. If the order has been partially filled, you can only cancel the unfilled portion. During the Market Posting (Pre-Open and Pre-Close) periods, no orders can be cancelled. CAN I POST GOOD-TIL-CANCELLED (GTC) OR GOOD-TIL-WEEK (GTW) ORDERS? You can post Good-Til-Week (GTW) orders. A Good-til-Cancelled order is a buy or sell order which remains in effect until it is either filled or cancelled. FirstMetroSec has a Good-Til-Week (GTW) order, which is similar to a GTC order except that it only remains posted for seven calendar days. For example, if you post a GTW order on a Tuesday, it will remain posted until the following week’s Monday. CAN I ORDER DURING OFF-HOURS? FirstMetroSec accepts orders during off-hours. However, the off-hour orders can only be re-checked by the system and, if valid, sent to the PSE during Market Pre-Open/Posting period the following trading day. IF I SELL MY STOCKS TODAY, CAN I USE THE PROCEEDS IMMEDIATELY? Yes. The sales proceeds may be used to purchase stocks immediately. 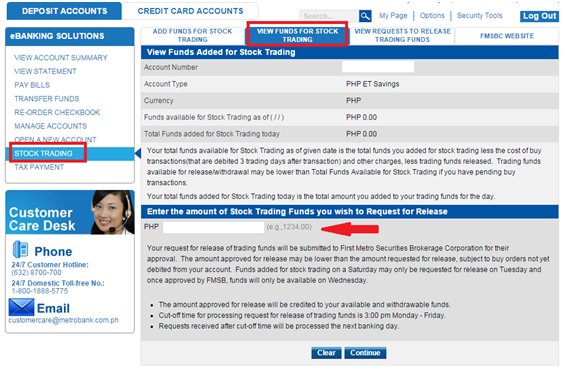 HOW DO I RELEASE PLEDGED FUNDS FROM MY STOCK TRADING ACCOUNT TO MY METROBANK DIRECT ACCOUNT? 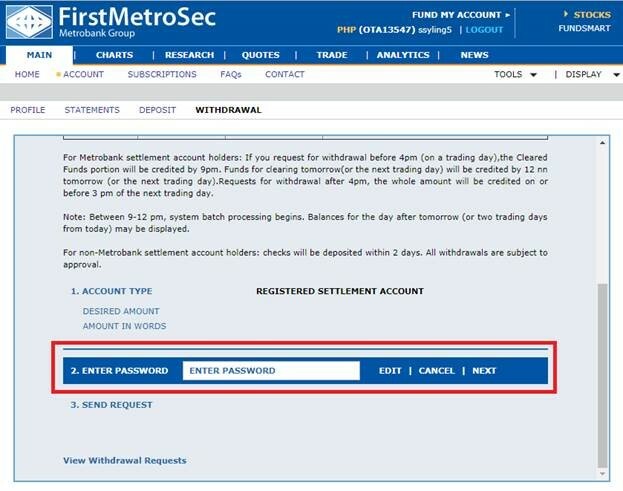 Pledged funds are earmarked funds to be transferred to your FirstMetroSec online trading account. 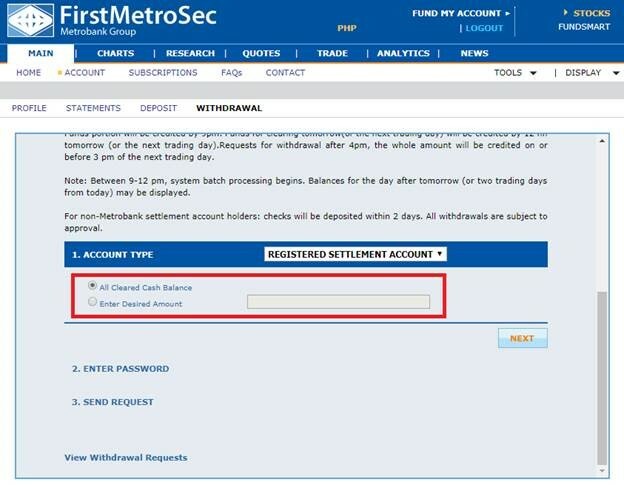 You may request to release the pledged funds that have not been debited to your FirstMetroSec online trading account or have not been used for stock purchases. Go to https://personal.metrobankdirect.com/ and log-in using your account details. Click on the tab View funds for Stock Trading. Enter the amount you wish to release and Click Continue. WHAT HAPPENS TO MY ORDERS IF THEY ARE NOT MATCHED AFTER THE TRADING HOURS? Your posted orders will be cancelled if the transaction is not done unless it is an unexpired GTW order. The funds held for your buy postings will be credited back to your cash position before PSE opens the following trading day. IS THERE AN OPTION TO TRADE ODD LOT SHARES? You can place odd lot orders during Market Open period only (9:30AM - 11:59AM and 1:30PM -3:16PM). HOW DO I REQUEST FOR WITHDRAWAL OF MY FUNDS? For Metrobank settlement account holders, funds will be credited on or before 4:00PM of the processing date. For non-Metrobank settlement account holders, funds will be credited (via check deposit) within two (2) business days from the processing date. All withdrawals are subject to approval. Note: Transfer fee is Php 75 per stock. Amount will be debited from the client's stock trading account or may be done via bank deposit.